Malatang literally translates as "hot hot hot" which really has no real meaning in English beyond expressing somthing spicy. It's like ordering from a canteen, you tell the person what you want - extra this, not too much of that - and then you choose what type of noodle you’re interested in. The spices and various sauces are then put into a bowl lined with a plastic bag. Then the noodles and veg are mixed up and boiled in a basket like contraption especially for the job. Wait about 30 seconds and the veg is done ready to be mixed with the sauces in the plastic bag, it’s all very simple and fast. It's acturally a very healthy way of eating, since you may order many kinds of vegetables, which got such a great tasty flavor, you may not want to miss the doufu, the mushroom, the potato...blablabla. To tell you the truch, the variety of the vegetables may amaze you. 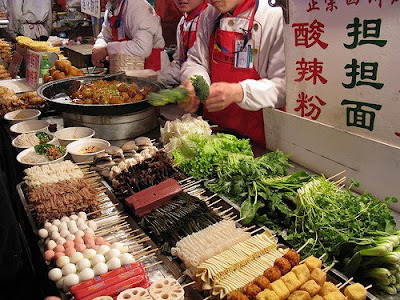 Malatang is originated from Sichuan, but soon enjoyes a national wild popularity as soon as it enter into other cities. Many people got rich because of this business. I even dreamed of operating one matalang shop myselves, than I would satisfy my stomach everyday and at the same time stuff my pocket. What a dream. Women especially like it, since they can got full and happy without meat - :) When I was in colleage, I often have a snap with my friends in the afternoon or in the evening outside, Malatang is our common choice with its cheap price and rich choice.